Save the Date-It’s Happening Again-JT Hodges & Friends 2nd Annual Holiday Howler – Benefiting the Brown Dog Foundation (and your pets)! What can you get for $5 these days? Not much unfortunately. But fortunately, you can GIVE a lot with $5. ‘Tis the season to be jolly, and caring and sharing. And once again, Show Dog – Universal Music country singer-songwriter JT Hodges will host his second annual Holiday Howler charity event, benefitting the Brown Dog Foundation. “Animals, like people, will get sick or need medical attention at some point in time and as a dog owner, I know those bills can be pricy,” said JT Hodges. 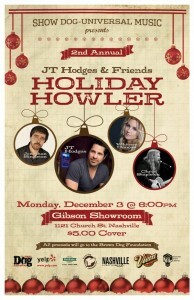 The writer-in-the-round style show (The Holiday Howler) will be held at Gibson Music’s Showroom on Church Street in Nashville Monday, December 3, 6pm at the Gibson Showroom (located at 1121 Church Street) and will feature musical performances from Hodges, Chris Stapleton, Jonathan Singleton and Whitney Duncan. Tickets can be purchased at www.browndogfoundation.org or a $5 donation may be given at the door. All proceeds benefit the Brown Dog Foundation. Hodges is an avid dog-lover and was motivated to host a fundraiser because of the unique mission of Brown Dog. The Foundation helps pet owners pay for life-saving veterinary care for their pets during times of temporary financial crisis. Hodges own dog, Dax, injured his leg a few years ago and required an expensive specialty surgery. Luckily, Hodges and his wife, Kasey have pet insurance, so their portion of the bill was reduced. However they recognize there are many people who are experiencing trying times and might not be able to afford costly vet bills when the family pet falls ill or gets injured. If you’re a pet owner and have ever been in the position of being unable to obtain proper treatment due to financial constraints, then I’m sure you’ll understand just how important a foundation of this sort is to a pet’s well being. So . . . If you’re unable to attend but still wish to help out, JT and his musical guests encourage you to make a donation to increase the amount raised to help families in crisis. You can help support your four-legged fury friends in their time of need, as they did for you in your times of need. PLEASE, be sure to remember our loyal fury friends who give us comfort, keep us company and okay, have an occasional mishap. Hey, two outta three ain’t bad. If you’re a dog owner you know, life wouldn’t be the same without them. So be sure to come join the fun or take a moment to donate if your holiday festivities have you booked elsewhere that evening. And while you’re at it, take a moment to read about Chocolate Chip, a chocolate Labrador retriever, whose story and condition resulted in the formation of the Brown Dog Foundation. On behalf of The Brown Dog Foundation and all the dogs in need, JT Hodges, Show Dog – Universal Music, Whitney Duncan, Jonathan Singleton and Chris Stapleton hope to see you there and thank you for your generosity.